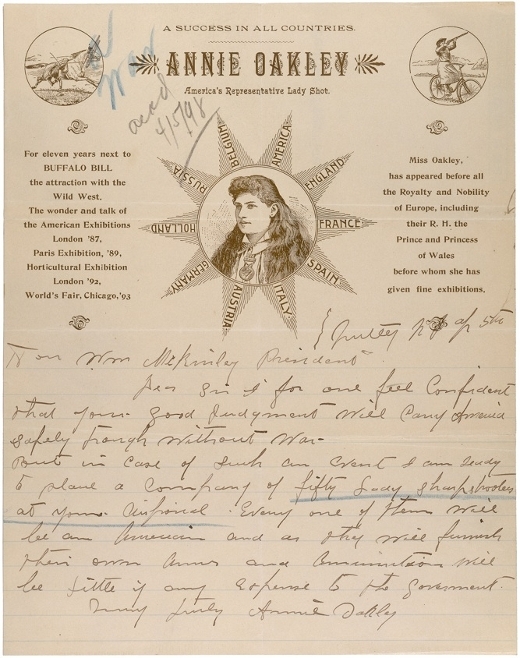 As the Spanish-American War loomed in April of 1898, celebrity sharpshooter Annie Oakley - a Buffalo Bill performer so famous that she was essentially the world's first female superstar - decided to donate her resources to the government by sending the following letter to then-U.S. President William McKinley. The offer was simple: Oakley would supply the military with a fifty-strong army of female sharpshooters so talented as to be indispensable at war. Much to her dismay the powers-that-be politely declined, but undeterred and forever the patriot she later repeated the offer prior to World War I. The response was the same. Dear Sir, I for one feel confident that your good judgment will carry America safely through without war. But in case of such an event I am ready to place a company of fifty lady sharpshooters at your disposal. Every one of them will be an American and as they will furnish their own Arms and Ammunition will be little if any expense to the government.